The area around Marina Bay is ideal if you are looking for a quiet holiday in an unspoiled location, but I cannot recommend this Hotel. Our room for three was basic but kept spotlessly clean every day. We were provided with a fridge, 2-ring hob but no pans or utensils for catering, and not enough cutlery. Staff happily provided these when we asked. The restaurant staff - Spiros, Malou and Larisse made us extremely welcome. The inclusive breakfast was very basic, and the restaurant over-priced. We found the best value lunch/evening meals in out-of-town roadside tavernas which are plentiful. I can particularly recommend the O Ainos Grill House in the plaza opposite the ferry port in Lixouri (terrific saganaki & stuffed pitas) the Old Stone House in Antipata and the Siroco Cafeteria opposite the supermarket in the main street in Skala. Marina Bay Hotel is perfectly located, situated right on the beach. Turtles nest there, and house martins swoop and dive over the pool. 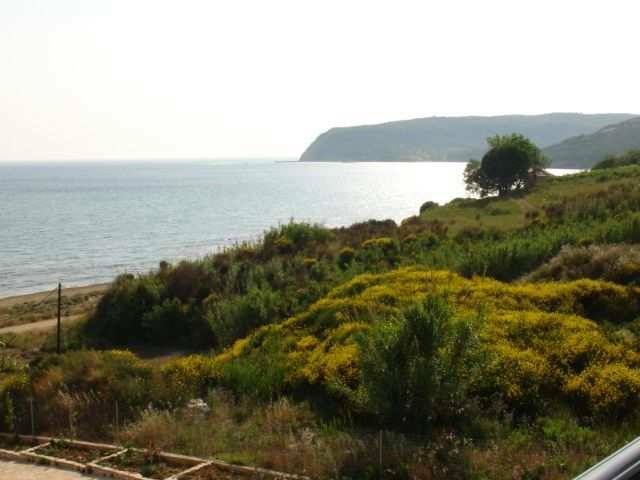 Great swimming in calm, clear shallow sea - ideal for children, and a small but clean freshwater swimming pool on-site. Unfortunately my holiday was overshadowed by the theft of my son's i-pod which he had handed to the hotel Manageress to be recharged overnight. Next morning it was 'missing', never to be seen again, and the Manageress not only denied responsibility for its loss, but put the blame on my 8-year old son for leaving it with her in the first place. 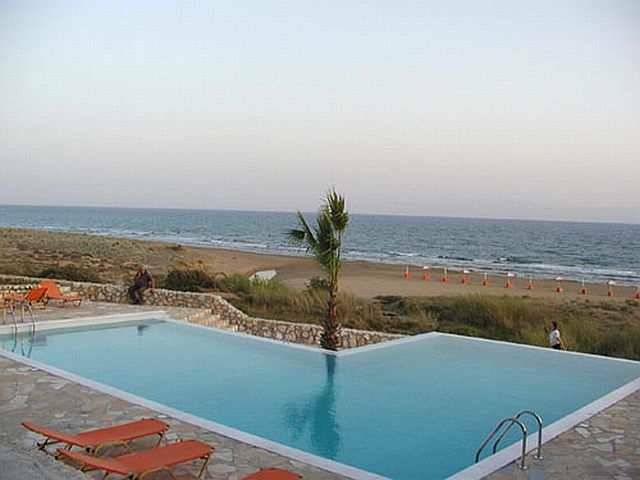 The ineffectual attitude of the Manageress and poor customer service we received in relation to the theft has put a blight on what otherwise has the potential to become a superb holiday destination. Please be warned - do not be lulled into a false sense of security. Keep valuables locked away and do not entrust them to the hotel management as you will receive no help if anything 'goes missing'. My partner, myself and two friends stayed here in June 2004. Its a bit off the beaten track so a car is a bonus. 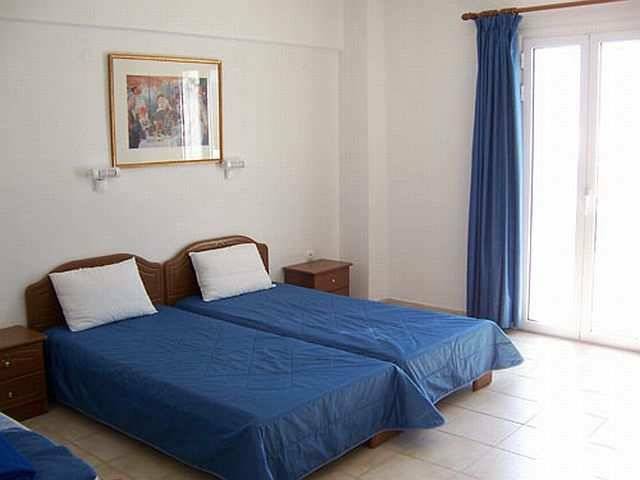 The apartments are situated right on the beach and are very clean, also the staff are friendly. We have booked to go back this June and cannot wait. This says something about the place because we have never been back to the same place twice, prefer to try different places usually. We stayed here in 2002 and loved it. We are going back in June this year and can,t wait to get there. Beautifully clean apartments, friendly staff and right on the beach. What more could you ask? We have just got back from a week at the Marina Bay apartments. We hired a car and had a week driving around the island. The location of the apartments means that it is essential to hire a car or motorbike while there. It is easy to do this from scala as well. Apartments are massive and bright and all have beautiful sea view. #They are vertually on the beach. Great for sunbathing but not ideal for families as very quiet. Buy your own snacks as very expensive at the beach bar. Dont buy an ice cream they are very expensive!!! We would stay again if we hired a car. Everyone I have ever met at Marina Beach has had nothing but praise for the location, the apartments and the staff. As I am about to visit for the 5th time, need I say more? As a couple just needing a totally relaxing holiday, this is excellent. Located right on the beach, the owners and staff are extremely friendly. Granted, unless you like walking, you need transport into Skala. Recommend a tour of the island (loved Fiskardo) although the wine tasting at 8am was a little too early! Try the local tour operators for a leisurely boat trip up the coast. We are returning in July for our 4th visit so it can't be too bad! The apartments are at the bottom of the dirt track leading down to the northern end of Kaminia beach. Location is excellent if you like it quiet, but transport is essential. The snack bar is extremely expensive and both the food and service poor. A long walk if you want to go to Katelios or Skala for food without transport. Overall we enjoyed it because of the quietness. Be prepared when you arrive for an interesting ride in ford fiestas with 4 passengers and luggage to get down there!! We stayed here in June 2003, we were found the sea view from our balcony was lovely providing you were standing, as the balustrade was too high to see over when seated. The snack bar was very expensive (8 Euros for 2 ice creams)and 7 Euros a day per person for a sunbed on the beach of the apartments/hotel. Drinks and meals were pricey too. Although we enjoy walking, we found the hike up the track to the main road was hard work, especially when there's a local driving up it very fast kicking up lots of dust!This takes 15 minutes then it's a 30 minute walk along the main road into Skala. It was a shame about this place because it has the potential to be a really special place but we found that the owners where just out to make as much out of the tourists as possible. we stayed here in june 2002 it is a beautiful location, the staff very friendly and a very low key atmosphere. As a couple it was paradise but families without cars weren't very happy as its 3km out of town. To me that made it all the more enjoyable being away from it all. The beach is gorgeous unspoilt and very quiet. I can recommend hiring a car for a few days as you can manage to see mst of the island in that time -its all amazing! I'm guessing this is the Marina Bay Beach Apartments at Mounda - which is about 3/4kms South of Skala. Okay - I stayed there in 2001 (I think they were a new build that year or the year before) and the reason I'm writing this review now is 'cos I'm doing a search for the apartments again - looking to return this year. 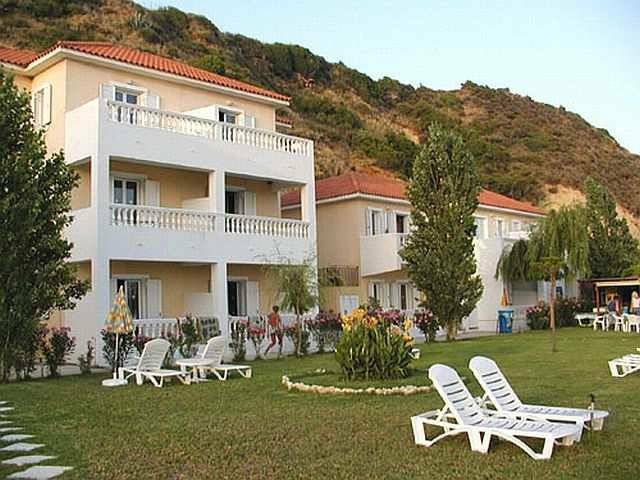 The accomodation was excellent, the owners and staff were friendly, the location was 1st rate - if you are searching for a blissfully quiet, undisturbed holiday with 3kms of undiscovered golden beach in apartments which are off the beaten track. A car is seriously recommended as it is literally off a beaten track !!! However, taxis were easily come by and pretty much on time. The apartments are served by a small beach bar which doubles as a breakfast bar and cafe/snack bar. Modest entertainment is provided on some evenings but quiet background music is played every evening. The apartments are located directly on the beach and it really is great chill-out holiday destination. Thoroughly recommeded for the 'right type' of holiday maker. I'll let you know whether it's changed . . .